Life got in the way and I was running so behind getting all these in the mail, but they are all one the way. I have 10 packages from the giveaways between the two blogs and one that I sponsored on Magical Holiday Home forum. The challenge was finding boxes for some of them! In one case, I opened the container and flattened it out and added the items to a small flat rate box. It was plenty big to hold things, but in the original container of the table items, they were stacked and made for a deeper and smaller shape. I did include the original plastic box container. I hope you don't mind dear friend. I think that this was Country Wings gift. I also left all the small cards at home when I went to the postal center on Friday with these, so they only have the return address! I did put printersdevil above my name and address for those of you who will remember that instead of my given name-Felecia. Sorry for the delay. I hope that you each enjoy your items. My dear sister was with me for almost a week at the end of July-first of August just prior to her move to Nebraska. During this time we also had her precious granddaughters and little grandson for a lot of the time. We had our CIJ family dinner on August 2. I found out that it is way too hot in Texas to cook like this during the heat of the summer! It was great though. We had around 25 for Sunday dinner and about the same number again on Monday evening for left overs. Dear sis's "man" flew in on Tuesday afternoon so we had the crew again on Tuesday evening. We had planned to all go out to eat that night, but decided that it would be more relaxed to just eat here. We tried to go simple with hamburgers and hot dogs, chip and dip and cookies. However, after a trip to Sam's Club and Walmart, we ended up also picking up potato salads, baked beans and the chips and dips. We also had over 40 ears of Nebraska corn. Dan called and we asked about the corn in his area and said that we loved corn on the cob. Then he called back that he was bringing corn! It wasn't really food that fit the menu, but it was so fresh! He bought it from a farmer who had picked it that morning! He brought it in a carry-on collapsible ice chest. He had called to make sure it was okay. However, when he got to the airport it set off the alarms and had to be unloaded piece by piece to be checked. It must have been hilarious. He had one woman who told him that she was going to grab the bag and run! It was the first time for him to meet much of our family and I think he was an instant hit with the corn. Actually he is a keeper and would have been a hit anyway. But, he sure found his way into this family's heart through the stomach and love of fresh veggies. Tanya (DSis) and Dan left here on Wednesday almost two weeks ago after we loaded the huge U-Haul to the brim. There wasn't room for much more than a small pillow!! Her SUV was also packed and on a trailer pulled behind as they headed north. My DH and I helped them load everything from her two storage sheds and came home and took a long nap. That afternoon, DD called on her way home to ask me to have the door open since it was storming. I got up and opened the door to find it almost dark and my huge oak trees bending over. DD got home and in about 15 minutes our electricity popped off. Just a few minutes later, my niece called and was hysterical. I thought she was saying that a train was in the middle of her house. We rushed out and headed over there. They do have a train track close by, but it runs the other direction, so I knew that wasn't what was wrong. She was frantic and crying about not finding the babies--her dogs. When we got there, we found a 65 foot tree of about 4 1/2 foot in diameter that had crashed through the side of their house and fell through the roof! My nephew was in the room that it came through and flattened. He had gotten up to go open the blinds when the electricity popped off and saw the tree coming down. He threw one of the little chiauhauas toward the door and tried to get out. He took a lot of impact from limbs and debris, but fortuanately got out enough not to be crushed by the tree. Fast forward a few hours and we had about 15 back here eating left-overs again since we got our power turned on first. They released him from the hospital thankfully with only bruises and sprains. To say it has been a crazy few weeks is an UNDERSTATEMENT! They spent that night with us as it continued to rain and storm. Their insurance company put them in a hotel the next day but they joined us a couple of times to eat during the week at night and often during the day to get out. We had had their Mini Pin, two birds and fish until tonight. They finally got them into a rental house on Saturday, but they still don't have it furnished completely. I think everything else is to arrive in the morning. At this point, the decision has not been made on whether they are going to pull the house completely down or not. The contractor says that the weight bearing walls are ruined. The tree fell completely through into the laundry room and two huge limbs into the kitchen and living room by morning. It was and is horrendous. So, needless to say, I haven't felt much like blogging. I also started back to work today. I only work part time and am off in the summer, but during the first few weeks of the school year I am there full time. So, this is my crunch time. I have been popping in and out doing some reading, but I will be back!!!!! Thanks for the comments that have been left lately. See you soon! We're having a membership drive at one of my favorite holiday spots on the web---Our Home for the Holidays forum. If you love the holidays come and join the fun. There is something for everyone from shoppers, crafters, bargain hunters, cooks, swappers, and lots of other forums, too. There is a wonderful group of members who share a love of Christmas and other holidays year round. If you aren't interested in all of this on a year round basis, come and join our seasonal members. Many return to active posting during the Christmas season. We also have forums devoted to other holidays---Halloween, Thanksgiving, Valentines, Easter, St. Patrick's Day. It truly is Our Home for the Holidays. Please stop by for a visit. If you decide to join (free, of course), introduce yourself in the Welcome thread and mention that I sent you. The Admins are holding a giveaway for membership recruitment. I am a moderator on the board, but am eligible to enter with new members brought in to our board. Wow, what a day of parties! I want to thank everyone who stopped by to visit me today and share in this great Christmas in July! Many of you stopped by as existing friends and followers, some came only for a chance to win a Christmas giveaway, others came through links to Maggi's CIJ party at Just Add Glitter and Stir or through a link from my Playing Dishes CIJ Tablescape Party or my Memes for Me blog, or just found this site by chance. No matter how or why you arrived, I would like to thank you from the bottom of my heart. Christmas is truly a magical time that I hold dear. However, July is a particularly difficult time in my life due to life's unexpected losses. Each year I struggle with the entire month of July, but this year, I shifted gears and extended my usual CIJ to include the entire month. Each of you has played a part in helping me through this time, even after my family experienced another two losses this month with the death of a wonderful uncle Leon, my husband's only brother, Larry, and our late son's beloved dog Blackjack. My faith continues to guide me through these times. I have enjoyed each and every comment you have left and have spent way too many hours reading and laughing at things on your blogs and countless wonderful hours working on my own CIJ parties, posts and giveaways. Wow, I sound like it is all over---not so! There is still another full week of CIJ and I have a huge family holiday dinner next weekend. Family is so important, so it is really fitting that that will be the final event for this fun filled month. Tonight, I just want to thank all of you for this wonderful weekend. My birthday was last week and I told my husband that all I wanted was some great holiday cheer and wow, did you all deliver! I copied and pasted the names of all the participants in Maggi's party into the post below and the links worked! That way I will be able to go back and revisit and savor the wonderful things found there. I will be visiting you often, please do the same. My Christmas Memories in My Heart blog will only have posts around Rudolph Day on the 25th of each month until the end of November, when I will be posting daily again. So check back around Rudy Day for a visit of holiday fun. Playing Dishes will continue to have posts related to dishes and my obsession with thrifting. My newest blog, Memes for Me will be devoted to the fun things in blog land. I will post things as they hit my fancy. Until next time, I am roping all of you Christmas lovers into my Christmas Memories in My Heart. I love things from the Southwest and the little musical cactus at the top is one of my favorite Christmas things. So, it is only fitting that he uses his lasso to pull us all together one last time. Enjoy the cartoon video with Paul baby singing about a wonderful Christmas. Please excuse me for posting this on both of my CIJ intensive blogs. I am way too tired to write another post to thank you all. I have an out off town on Sunday for a meeting and will post the giveaway for Playing Dishes on Monday. I want to make sure that everyone has time to visit and I have time to add all the new names! I am crossing my fingers and hoping that this will work. I just went back to visit the party at Just Add Glitter and Stir and found a note from Katamommy that she would live the list of participants up through Sunday night. I hadn't thought about it going away. I want to savor all the info and be able to revisit each one so that I can add recipes and crafts to my notebook. I spent HOURS visiting today, but only brushed the surface of all the wonderful holiday cheer. I had so much fun today and am totally exhausted from all the partying. Thanks to Maggi~katamommy for organizing this fantastic Christmas in July party and another thanks to all the participants. I even read all the comments as I was leaving mine and they were great too. I love a good party and Christmas parties are the best! In addition to my final CIJ Tablescape Party over on Playing Dishes, Maggi~katamommy over at Just Add Glitter and Stir is having a CIJ party all day Saturday, July 25. So click on the link and go on over and join the fun. 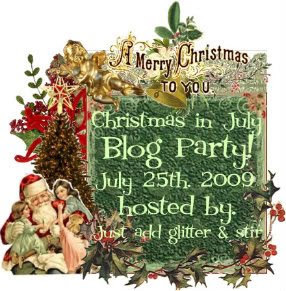 She has Christmas music playing, has altered her blog title just for the occasion and has a great group of guests, who all have something special for Christmas on their blogs. So, settle back and enjoy this wonderful weekend of Christmas in July. Don't forget to set your DVR to record QVC's Christmas in July 24 hour sale. (You can also log on to view at www.qvc.com). Now for some fabulous Christmas tablescape fun! As most of you know I have several blogs and am hosting a CIJ Tablescape Party each Saturday during July. This is the final week for this party. Since I posted about my new tea set on this blog, I decided to do a quick tea party for one to link to my Playing Dishes blog party. Hey, it is blog land, so I can attend my own party as a guest! Click here to visit the CIJ Tablescape Party Week 4. You will be able to see my table for this week and find links to all the other participants. Be sure to leave us comments because we love them. I love the song, On the First Day of Christmas and when I found this cute little partridge in a pear tree a couple of years ago, I was estactic. I found it at Goodwill, still in the form cut stryofoam container. It has an ornament representing each of the 12 days in the song. This little tree has been displayed during the holidays since that time. I have had so many people comment on it and ask where to buy one like it. It seems to be rather unusual. I read on one of my Christmas message boards that HSN was hosting an early Christmas in July on the 15th, so I logged on to see what they had since we don't receive that network on my cable. 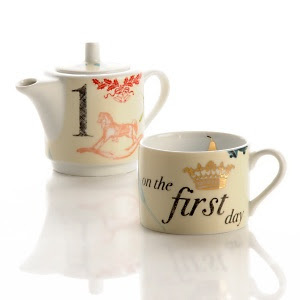 I found the cutest little teapot for one called The First Day of Christmas and just had to order it. Although the first day of Christmas isn't until Dec. 26, I plan to use this little teapot on Black Friday, which to me opens the holiday season. I think I might also use it on each Rudolph Day on the 25th from now until then also. Now that I have my little partridge in the pear tree out of the storage shed, it will also probably be used on each of these special days to help me feel the upcoming holidays. Doesn't it just make you feel all warm and Christmasy? If you have time to stay awhile, we can enjoy a cup of tea and I will let you use my new little treasure. The drawing for the Christmas tablecloth giveaway to mark the end of this blog party will be held on Sunday.